Click on any image here to open it up in Flickr, where you can see a 100% scale screen shot. I have marked areas of interest with red circles and letter codes. If you have the images open alongside this article, it should be easy enough to follow even for those who do not have this beta version. These screen shots were taken in Windows 7 64-bit, but should be similar in all supported operating systems. Here is a typical library ensemble open in Reaktor. The left of the window is taken up with a tabbed interface containing four panels for manipulating your patches (by which I mean ensembles, instruments, macros etc.). The bottom part of the screen shows the map editor. Above this are two panels showing the current ensemble: the panel to the left and the structure to the right. I chose this particular configuration of the Reaktor interface since it shows as many pertinent details as possible. Without further ado, here are my eight suggestions. The Reaktor toolbar contains a handy Info button (A) that turns on tool-tips. These provide help text when you float the mouse over the element in question (B). However, they only work with elements of an ensemble. This functionality should be extended to include elements of the Reaktor UI itself. For example, what does the spanner icon (C) do? Even with Info on, we cannot tell. The vertical divider toolbar has two icons at the bottom. The waveform icon (D) displays the Map Editor; the play button displays the Player Recorder. In the previous version the former was a modal dialogue window that restricted access to the rest of the interface. The Player and Recorders were separate windows one could toggle on and off. I can understand the motivation in making these functions consistent and in getting rid of the modality. However, in the current UI the position of these panels is restricted. What if I do not want the Map Editor (E) at the bottom of the screen? This is especially an issue on laptops with wide screen LCD aspects (which is nearly all of them, these days). Vertical space is precious. These panels need to be moveable. At the very least all panels should be able to dock on any border we choose. Ideally, we should be able to unpin these and turn them into fully functional floating windows. I am sure this would be a great boon when using multiple monitors. The input/output level indicators now have handy volume faders (F) directly on the Reaktor toolbar. That's wonderful as a start. But for some reason they only respond to click'n'drag operations. The volume should also jump on mouse clicks since that is a faster operation. Further, there should be an area provided to mute I/O. Yes, processing can be turned off completely, but that is not the same functionality. Support for the right-mouse click is weak throughout Reaktor; this is one place it could provide for excellent context-sensitive functionality. Why not allow direct interface assignment with the right-mouse? Rather than fishing through a preferences dialogue, we could immediately assign software to hardware I/O right here. The current UI has two ways of doing exactly the same thing. The magnifying glass icon (G) and divider arrow (H) both hide/reveal the tabbed context panel. To my mind the magnifying glass icon conveys the wrong semantics. Through metaphor and repeated usage in other interfaces this icon means "search". But here that meaning is refuted. The solution is simple: get rid of this redundant button. Here is exactly the same interface with some further areas of interest marked. The Browser (I) allows us to look for components in several pre-defined places. But most of us have hundreds or thousands of these. Finding the one we are looking for is tedious at best. The context panel, consisting of four tabs (J), is fixed to the left of the Reaktor window. This means that we must choose to view either the Browser, Snapshots, Panelsets or Properties, and furthermore must view them in exactly this position. But what if we want to see more than one? What if we want them somewhere else? Both of these options were available in the last version of Reaktor, since these were independent windows. In fact the Properties panel shows how this can be done. It may not be immediately obvious, but this panel can be unpinned (undocked) and allowed to move freely. This functionality needs to be extended to the other tabs. The main Reaktor menu is currently accessible in two places: the main application window menu bar (M) and a pull-down menu inside the interface itself (N). 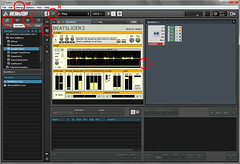 The reason for this is that when Reaktor is used as a plugin, M is unavailable. Yet the designers did not want to provide only N, as this requires one extra crucial mouse click to activate. I understand this decision, but believe that once appropriate right-click functionality is implemented in a context-sensitive manner throughout Reaktor, the main menu will be redundant and can be removed. This will still leave from two to four ways of achieving a given task (these being: direct access button, right-click context menu, main application menu, hot key). As a benefit more screen real estate will be freed up -- every pixel counts! Further, I note that clicking on the Reaktor logo currently duplicates the functionality of clicking on the NI logo -- it brings up the About Dialogue. Instead, make the Reaktor logo the main menu. The obscure down arrow button can be removed entirely. None of these improvements are in any way difficult to implement from a technical perspective. Neither would them make the interface more complex to use for beginners. But they would streamline operations for those of us who work with Reaktor every day, and help make it a fantastically productive product. I know that certain manufacturers do read this blog and note my opinions; I sure hope Native Instruments is among them! In a future article I will look under the hood and suggest some improvements to help those of us who build in Reaktor. The release date for Reaktor 5 has been announced as September 1, 2010. Full info page is now available on the NI site.